My eyes shot forward. Standing before me was a girl, long blonde hair braided down the side of her head, blood splattered throughout. Her brown eyes sunk into me like syringes, and when she smiled, her teeth shone in two rows of needle-like sharpness. “You don’t want to miss out on dinner, do you?” The boy who’d been lazily lounging in his chair turned to face us, his black hair and eyes gleaming. He reminded me of the serpentine dark angel, the one who stood out like a demonic shadow against the snow and had taken the place as the face of my nightmares. The other two laughed as if Angie and I had just missed out on the world’s best inside joke. I shoved Angie behind me, hoping to shield her with my body even though I knew they could crush me like a piñata. As opposed to helping their friend, the other two began laughing again, the sound reminiscent of a pack of hunting hyenas. The distraction provided just enough time for Angie and I to burst through the door, adrenaline pumping as we raced through the night air and back to our own room. We made it a few yards before I felt a hand on my ankle, pulling me down until my face collided uninhibited with the plaster sidewalk. Angie, not wasting a second to look back, made her way to our room and slammed the door behind her. I turned to find the girl again, her smile menacing. The other two went after Angie, pounding on the locked door. I lay frozen, my face throbbing and my heart racing. I should consider us lucky. Angie had made it back to our room, and I’d made it this long. A gunshot rang out. The girl backpedaled, her hand holding her wounded throat as silver liquid poured past her fingers. She bared her teeth, a slight, breathy growl coming from her open throat. “Hush,” a voice whispered in my ear. I couldn’t see the person standing behind me, but the voice was a deep baritone, and I knew he was quite tall from the way his arm encircled me. “Don’t move,” he said. His voice was loud and clearly directed at the girl before us. To my surprise, she complied. I could see the anger increasing in deep lines across her face, but she made no move toward us. My mind flashed to Angie. I tried to look behind me, but burgundy fabric blocked my path. “You humans can fight back all you want, but there are far more of us than there are of you,” she said. The girl hissed, leathery wings spreading from her shoulder blades as she shot upward into the sky leaving a trail of silver blood in her wake. 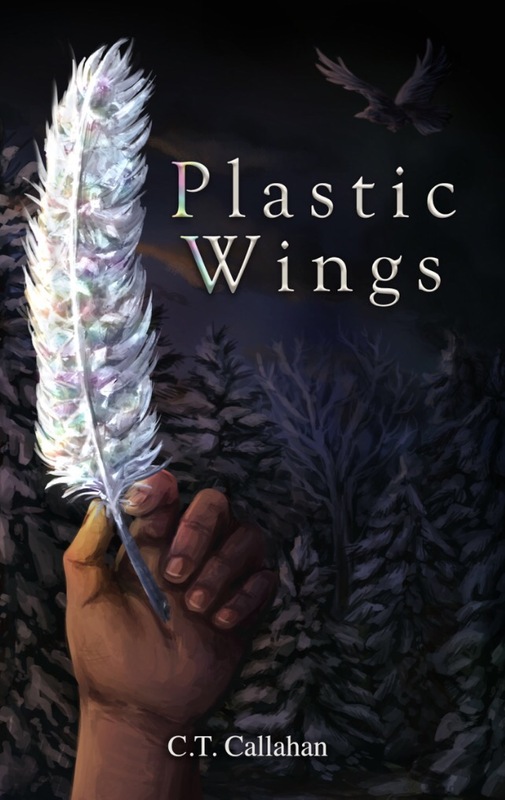 Plastic Wings releases November 22, 2016. Find it on Goodreads!